Welcome to Round 8 – the final Swiss Round in Day 1 of the 2018 Central America World Championship Qualifier! 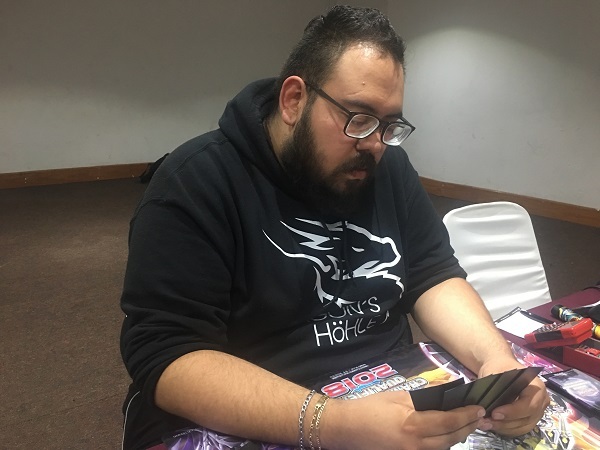 Alejandro Garcia Moreno won Mexico’s National Championship in 2016, YCS Costa Rica in 2016, and is a 2-time UDS winner having won the UDS in Peru and the UDS in Trinidad & Tobago last year. Now he’s featured in our Round 8 Feature Match! 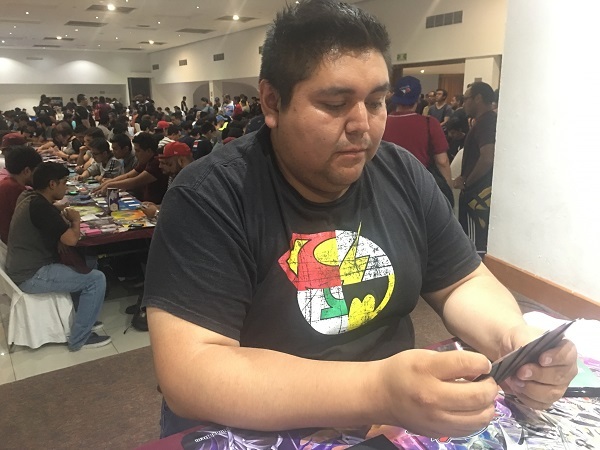 He attended the World Championship last year as a result of having the most Worlds Qualifier Points, and he’s the current points leader for Mexico. As likely as it is that he may attend the World Championship based on his Worlds Qualifier Points, he’s aiming for a first place finish this weekend in order to guarantee himself an invitation to compete. He currently has a 5-2 record and is facing off against Luis Trinidad Sanchez Lorano, who has the same record. A victory in this round will allow one of these Duelists to advance to Day 2 with a strong shot at a Top 64 finish. It’s time to Duel! Sanchez started off Duel 1 by activating Union Hangar, adding A-Assault Core from his Deck to his hand. He Summoned it and used the effect of Union Hanger to equip it with a B-Buster Drake from his Deck. He Set a card to his back row and passed his turn. Garcia opened up with Trickstar Candina, Trickstar Lycoris, Ash Blossom & Joyous Spring, Sky Striker Mobilize – Engage!, Sky Striker Mecha – Hornet Drones, and Pot of Desires. He activated Sky Striker Mobilize – Engage! to add Sky Striker Maneuver – Jamming Waves! to his hand and then activated Pot of Desires, banishing the top 10 cards of his Deck face-down to draw Terraforming and Sky Striker Mecha – Widow Anchor. He activated Terraforming to add Trickstar Light Stage from his Deck to his hand, and then activated it to add Trickstar Lycoris from his Deck to his hand. He used the effect of Light Stage to try to freeze the card in Sanchez’s back row, but Sanchez sent Ghost Ogre & Snow Rabbit from his hand to his Graveyard to destroy the Light Stage. Next, Garcia used Jamming Waves to destroy Solemn Strike and then activated Hornet Drones to Special Summon a Token. He used the Token to Link Summon Sky Striker Ace – Kagari and then used its effect to return Sky Striker Mobilize – Engage! to his hand. He activated Engage to add a Hornet Drones to his hand and then draw a card. He activated the Hornet Drones to Special Summon another Sky Striker Ace Token and then Normal Summoned Trickstar Candina. He used Candina’s effect to add Trickstar Lilybell to his hand and Special Summoned the Lilybell in Attack Position with its effect. He used a Token and Kagari to Link Summon Knightmare Cerberus and then discarded Candina from his hand to destroy A-Assault Core. Sanchez protected it by sending B-Buster Drake to the Graveyard, and Garcia sent Ash Blossom & Joyous Spring from his hand to his Graveyard to negate the Buster Drake’s effect in the Graveyard. Next, Garcia combined his Cerberus with Candina to Link Summon Topologic Trisbaena and attacked A-Assault Core with Trisbaena, destroying it. Sanchez used the effect of A-Assault Core to return B-Buster Drake to his hand. Lilybell attacked directly next, adding Lycoris to Garcia’s hand. Next, Garcia activated the effects of the 2 Lycoris in his hand to Special Summon them and return Candina to his hand. Both copies of Lycoris attacked directly, dropping Sanchez down to 3400 Life Points. 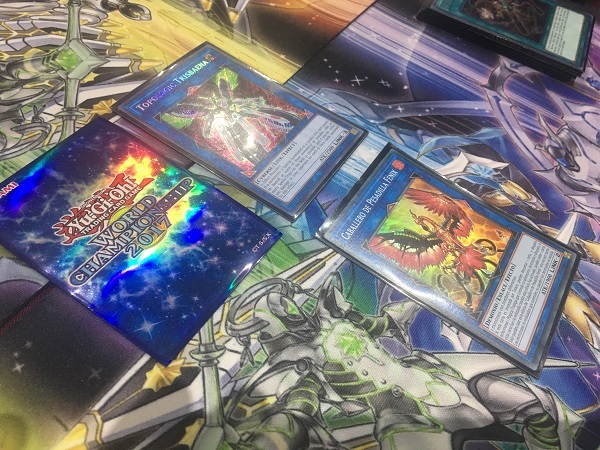 Garcia combined his 2 copies of Lycoris to Link Summon Trickstar Holly Angel Linked to Trisbaena, and then Trisbaena’s effect kicked in to banish it along with Union Hangar, dealing 500 more points of damage to Sanchez. Sanchez Set 2 cards to his back row and then Normal Summoned B-Buster Drake. He flipped the Monster Reborn he had just Set next, and Special Summoned A-Assault Core from his Graveyard. He sent both monsters to the Graveyard to Special Summon Knightmare Phoenix and used the effects of his monsters. He discarded Evenly Matched with Phoenix to try to destroy a face-down Widow Anchor, and Garcia Chained it to take control of the Phoenix. As Sanchez was resolving the effects of his other monsters he conceded, seeing no way to win the Duel. Sanchez Normal Summoned Silver Gadget and used its effect to Special Summon C-Crush Wyvern from his hand. 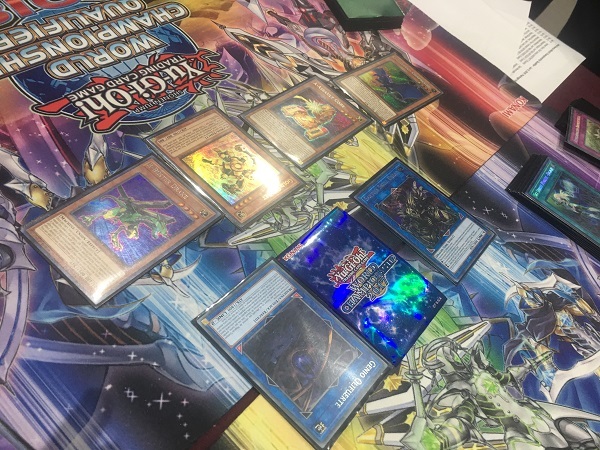 Garcia opened up Duel 2 with Evenly Matched, Sky Striker Mecha – Hornet Drones, Pot of Desires, Scapegoat, and 2 copies of Trickstar Reincarnation. He activated Pot of Desires by banishing the top 10 cards of his Deck face-down, but lost out to Ash Blossom & Joyous Spring. Next, he entered his Battle Phase and activated Evenly Matched from his hand, forcing Sanchez to banish C-Crush Wyvern from his field face-down. He activated Hornet Drones in Main Phase 2, Summoning a Token that he used to Link Summon Sky Striker Ace – Kagari. He used Kagari’s effect to add Hornet Drones from his Graveyard to his hand and then Link Summoned Sky Striker Ace – Shizuku by using Kagari as a Link Material. He Set Scapegoat and 2 copies of Reincarnation before passing. Sanchez attacked Kagari with his Silver Gadget, and Garcia flipped Trickstar Reincarnation to force Garcia to banish his hand and draw a new one. Silver Gadget was destroyed in battle, and then Sanchez Special Summoned Gold Gadget from his Deck. He used its effect to Special Summon B-Buster Drake from his hand and then attacked Kagari with Gold Gadget to destroy it. Buster Drake attacked directly next, dropping Garcia down to 6400 Life Points. In Main Phase 2, Sanchez activated Union Hangar and Normal Summoned A-Assault Core. He equipped it with a C-Crush Wyvern from his Deck thanks to Union Hangar and then Link Summoned Qliphort Genius. He used the effect of B-Buster Drake to add A-Assault Core to his hand and then banished A, B, and C from his Graveyard to Special Summon ABC-Dragon Buster. In his End Phase, Garcia flipped Scapegoat to Special Summon 4 Sheep Tokens to the field, and Sanchez discarded the last card in his hand to banish Garcia’s face-down Trickstar Reincarnation with ABC-Dragon Buster. Garcia drew Terraforming and then Link Summoned 2 Link Spiders using 2 Sheep Tokens. 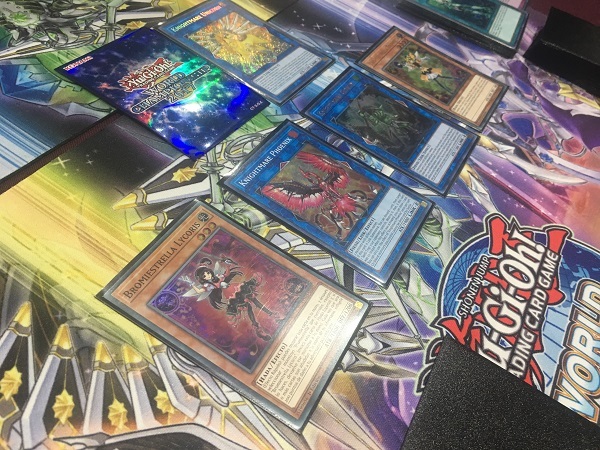 He combined a Link Spider with a Token to Link Summon Knightmare Phoenix behind the Link Spider in his Extra Monster Zone next, discarding Terraforming to destroy Union Hangar and draw a card. Next, he combined Link Spider with a Token to Link Summon Knightmare Cerberus co-Linked with his Phoenix. He activated its effect and discarded Hornet Drones from his hand to try to destroy ABC-Dragon Buster. Sanchez Chained the effect of his Dragon Buster to Tribute it and Special Summon A, B, and C from his Banished Zone in Defense Position. Garcia combined his 2 monsters to Link Summon Saryuja Skull Dread and then activated Sky Striker Mobilize – Engage! to add Sky Striker Mecha – Widow Anchor from his Deck to his hand and draw Droll & Lock Bird. Drawing no help, Garcia conceded, knowing that Sanchez would Summon another ABC-Dragon Buster on his next turn. Sanchez ties up the score and pushes the Match to a third and final Duel! Garcia opened up with Twin Twisters, Scapegoat, Trickstar Lycoris, Trickstar Light Stage, and Sky Striker Mobilize – Engage!. He activated Engage to add Hornet Drones from his Deck to his hand and activated it to Special Summon a Token to his field. He used the Token to Link Summon Sky Striker Ace – Kagari and then used Kagari’s effect to add Engage back to his hand. He activated Light Stage next, using it to add Trickstar Candina to his hand. He Summoned Candina and activated its effect, and when Sanchez sent Ghost Ogre & Snow Rabbit to the Graveyard to try to destroy Candina, Garcia Chained the effect of the Lycoris in his hand to return the Candina to his hand and Special Summon Lycoris. He added a Trickstar Reincarnation to his hand with the effect of Candina, and then Link Summoned Sky Striker Ace – Shizuku by using Kagari as a Link Material. He Set 3 cards to his back row and added a Sky Striker Mobilize – Engage! to his hand in the End Phase with Shizuku’s effect. Sanchez drew a card, losing 400 Life Points, and then Set a card to his back row. He activated Twin Twisters by discarding Anti-Spell Fragrance and targeted Garcia’s face-down Twin Twisters and face-up Light Stage. Garcia Chained the Twin Twisters to destroy Sanchez’s face-down Terraforming. Sanchez activated Hornet Drones next, and used the Token to Link Summon Kagari. He used Kagari’s effect to return Hornet Drones to his hand and lost 200 Life Points. He activated the Hornet Drones to Summon another Token and then combined his 2 monsters to Link Summon Knightmare Cerberus. He discarded Twin Twisters to activate its effect and destroy Lycoris. He ended his turn, and Garcia flipped Scapegoat in his End Phase to Special Summon 4 Sheep Tokens! Garcia drew a card and then used Shizuku to Link Summon Kagari. He used Kagari’s effect to add Sky Striker Mobilize – Engage! to his hand and then combined a Sheep Token with Kagari to Link Summon Space Insulator in an Extra Monster Zone, and then used a Sheep Token to Link Summon Link Spider behind it. He combined his Spider with a Token to Link Summon Knightmare Goblin and then Normal Summoned Candina next to it. He used Candina’s effect to add Lycoris to his hand and then Special Summoned Lycoris by returning Candina to his hand. He Summoned Candina again, using its effect to add Trickstar Lilybell to his hand, and then used Lilybell’s effect to Special Summon it. He Link Summoned Knightmare Phoenix next, and then combined Space Insulator with Lycoris to Link Summon Knightmare Unicorn. He used the effect of Unicorn to return Sanchez’s monster to his Extra Deck and then attacked directly with his field of monsters, dropping Sanchez down to 1800 Life Points. He used Lilybell’s effect to return a Lycoris from his Graveyard to his hand, and then returned Lilybell to his hand to Special Summon it. He banished Trickstar Reincarnation from his Graveyard to Special Summon Candina in Attack Position next, and then direct attacks from Lycoris and Candina finished Sanchez off! Alejandro Garcia Moreno moves on to Day 2 with a 6-2 record!